The publisher Leonard Smithers was a brilliant but shady character who operated on the fringes of the rare book trade, issuing small, clandestine editions of risqué books with the boast: 'I will publish the things the others are afraid to touch'. Smithers encouraged Beardsley's interest in French, Latin and Greek texts of this kind and commissioned drawings to illustrate Aristophanes's famously bawdy satirical play Lysistrata and the Satires of the late Roman poet Juvenal. Beardsley made a number of drawings which illustrate Juvenal's misogynistic Sixth Satire, 'Against Woman'. Juvenal cites the Empress Messalina as an exemplar of feminine lust and degeneracy, describing her nightly visits to the stews of ancient Rome where she posed as a prostitute in order to indulge her desires. 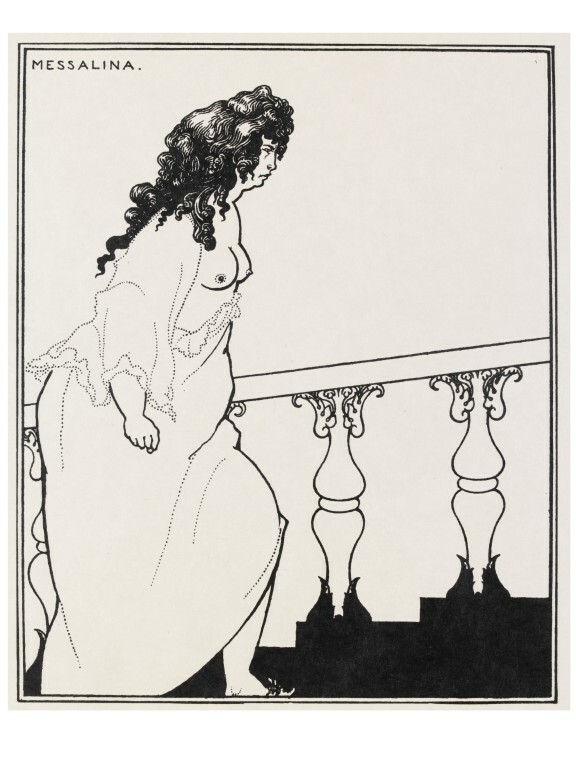 In an earlier drawing of 1895 Beardsley had depicted her leaving the palace, disguised and attended only by a maid. In this second and more powerful treatment of the subject, he chose to illustrate the lines in which the poet describes Messalina returning to the palace, angry that her lusts remain unsatisfied. Print of a woman dressed in a loose gown, her breasts exposed, climbing a baroque staircase. Illustration for the Sixth Satire of Juvenal, published in An Issue of Five Drawings illustrative of Juvenal and Lucian, Leonard Smithers, London, 1906. 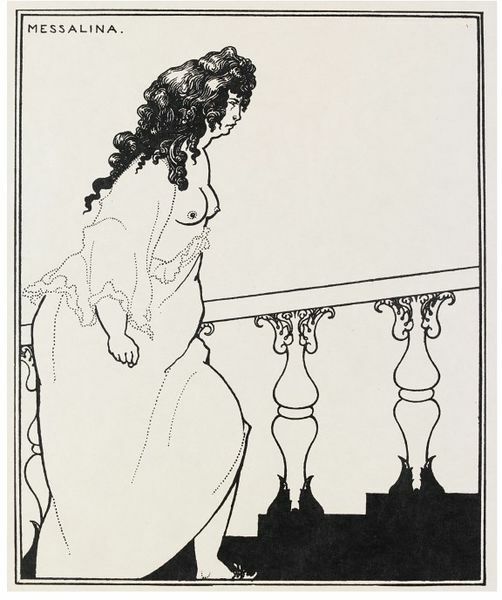 Print by Aubrey Beardsley (1872-1898). 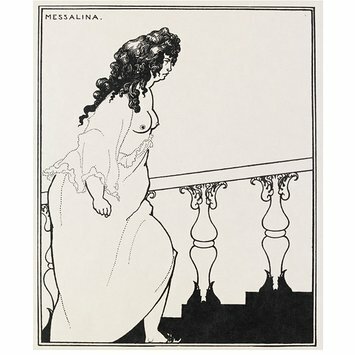 'Messalina returning from the bath', 1906. Stephen Calloway, Aubrey Beardsley, London, 1998, pp.179-80.